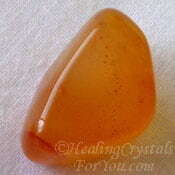 Bustamite has a strong heart chakra energy that will attract happiness and blissful feelings. Their vibration may also help you to develop your intuition, and they may help you to release stress by their action to create a tranquil and peaceful environment. 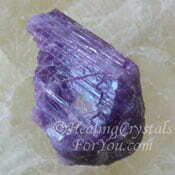 These crystals help inner child healing and also have a number of other physical and emotional healing attributes. 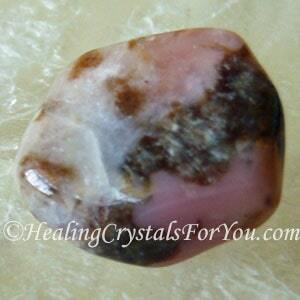 They are beneficial healing stones that may also clear any energetic blockages or sluggish energy from within the general region of the heart. 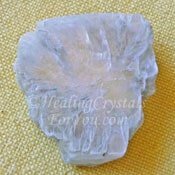 These are wonderful crystals to use in meditation as they create a safe space that is known to assist you to make contact with angelic beings. The meaning of this crystal's name relates to the name of a Mexican general named Anastasio Bustamante, after whom it was named. Their color is generally in shades of pink, but they can vary a lot. The color range includes lighter pink, pinkish red, deeper rose pink and they may even a dark brownish red. Many contain black manganese in them and this may depend on the location where they are sourced. There are a few localities where good deposits of Bustamite have been found. 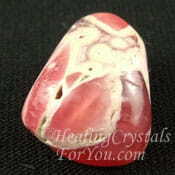 Deposits have been found in South Africa, the USA and in Brazil alongside deposits of Rhodonite, which has a similar color to this stone and also often contains black inclusions of manganese. This mineral is also found in Britain, Norway, Sweden, Italy, Germany, Bulgaria, Russia, Japan, Honduras, Peru, Argentina and New Zealand. These crystals have a lovely calming action within the heart chakra, as well as bringing a sense of lightness and joy into your life. 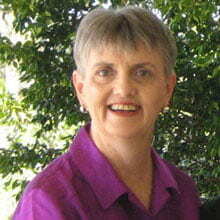 They will both activate the heart area and clear any stagnant energy there. 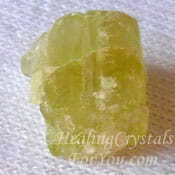 They help to create an excellent healing effect for heart related health problems as they are strong heart chakra stones. 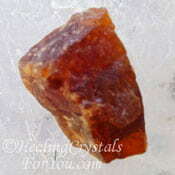 Bustamite stones have valuable crystal properties that make a strong connection to the earth. 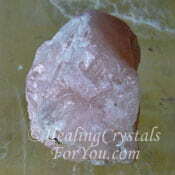 It is an excellent stone to use for griding, to create a safe place to do spiritual work. 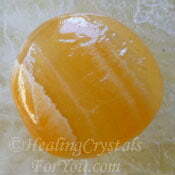 These stones also resonate within base or root chakra and the sacral or navel chakra. The navel or sacral chakra is the area related to your creative gifts, and these stones are known for their action to enhance your creativity. 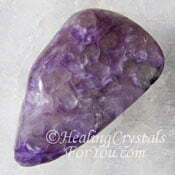 One of most advantageous uses for them is to use them to do a crystal meditation. 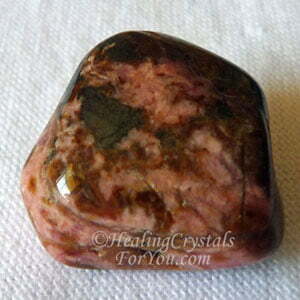 It is a wonderful stone to use for meditation and may help you to develop your intuition. Like many stones, they have a number of useful attributes that you will become aware of when using them in this way. Use them to travel in the higher realms as they are excellent to assist you to make contact with your spirit guides and with angelic beings. A specific meditation you can use them to do is a inner child meditation, which may help you to resolve or let go of hurtful issues that you have been unable to release before. 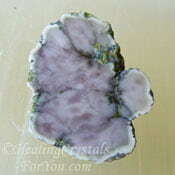 Having pieces of this stone in in the area where you live may be helpful to create a more peaceful environment. 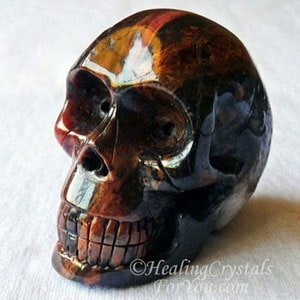 My Bustamite crystal skull can be used in meditation, but is also beneficial to have nearby to boost the harmony of your living space. I often use my crystal skulls as part of a crystal grid. 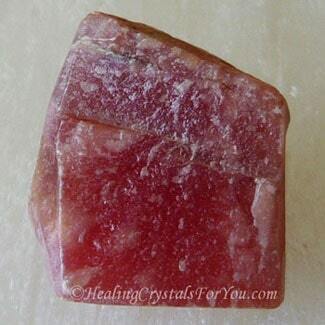 It is beneficial to set up a grid using pieces of this crystal and placing it somewhere in your living space. 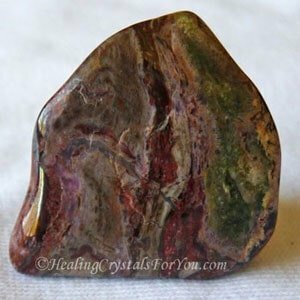 This stone is helpful to use on your body or alternatively you may like to keep it nearby to clear any stagnant energy there. 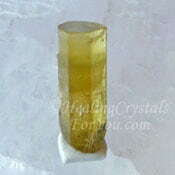 You can combine it with other crystals, especially quartz to boost the energy resonating from the grid. 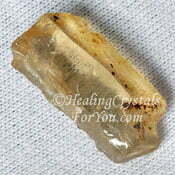 These crystals are on the Libra birthstone list, so if this is your sign you might choose to wear one of these stones. 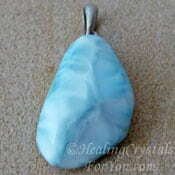 Of course you do not have to be a Libran to gain a benefit from wearing Bustamite jewelry. 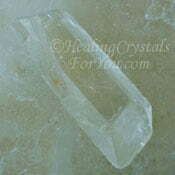 These happiness crystals are lovely to keep on your body as they are quite calming. 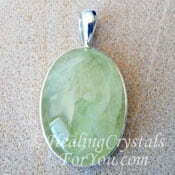 They will help you to release stress and aid you to experience lovely positive feelings. They are known for their action to evoke euphoric feelings of joy, happiness and bliss! 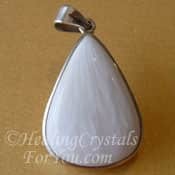 If you are unable to get jewelry made from this stone, simply put a piece in your pocket, it will have the same effect. I prefer to wear jewelry as its easier to put on and go, but the metaphysical properties of a stone is the same. "The most important thing is to enjoy your life, to be happy, it's all that matters." Audrey Hepburn. For healing the inner child, you may choose to use a number of stones at specific places on the body. 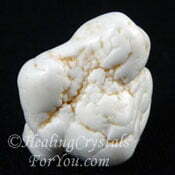 Stones for this use are outlined in my article on inner child healing. 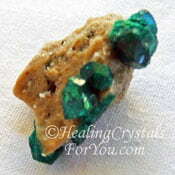 Stones to use for this purpose includes Dioptase, Rhodochrosite and Smokey Quartz along with quite a few other stones. Stress and anxiety are endemic in most countries across the world, so it is advantageous to know which stones that you might choose to use to help you to relieve your stress. 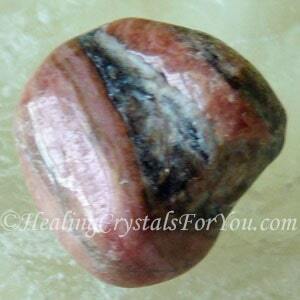 This stone is helpful to aid you to let go of stress, but if it does not give you sufficient relief when used alone, you may choose to combine it with other stress relief crystals. 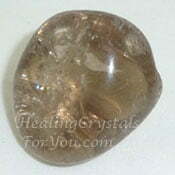 Stones for this purpose are talked about on my in-depth page about relieving stress. Using some of the stones that contain lithium may be advantageous, such as Lithium Quartz, Amblygonite and Lepidolite, as they are very helpful to assist stress, anxiety and depression. 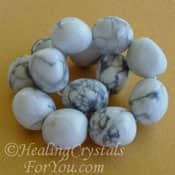 There are a large number of other stones that aid stress and you may find that some of these are already in your collection, so check out the page above to see which ones may help you. 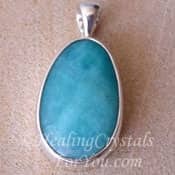 While I find the three above are very effective a few of my favorites among the other stones on the list are Amazonite, Scolecite, Kunzite, Aquamarine and Larimar. If you are interested in using this stone to find your spirit guides, it can be advantageous to combine it with other stones for this purpose. Crystals that you might also use for this reason includes Rainbow Moonstone, Charoite, Purple Scapolite, Covellite, Magnesite or Kyanite. 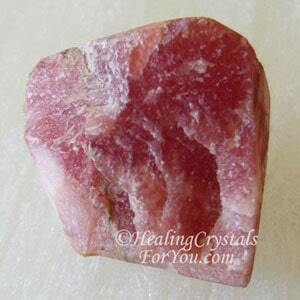 To assist you with to develop your intuition you may use this stone on its own or combine it with other crystals that stimulate your intuitive abilities. Stones you might choose to use with it includes Prehnite, Amethyst, Aquamarine, Euclase, Dumortierite, Rainbow Moonstone or Iolite. 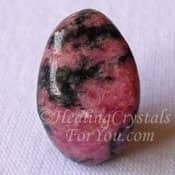 This stone has a lovely action to stimulate contact with angelic beings. 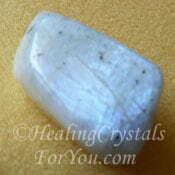 To strengthen the energy, use it in meditation with other stones that may aid contact with the angelic realm. There are a number of well known crystals to choose to use for this purpose, including Celestite, Prehnite, Angelite and Seraphinite, as well as some less common stones such as Datolite, Pollucite, Tunellite, Cryolite or Morganite. 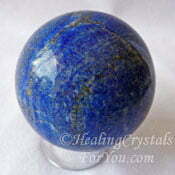 To aid you discover gifts that you may not have been aware of, combine it with either Rhodonite or Lapis Lazuli Stones. If you wish to use it to enhance your creativity, combine it with other strong creativity stones. 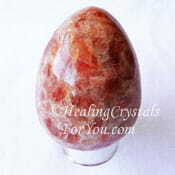 Specific stones that will work well in combination with this stone includes Orange Calcite, Sunstone, Carnelian, Brazilianite, Heliodor, Triplite, Yellow Labradorite or Golden Rutilated Quartz. Please note that many of the stones listed above have in-depth pages written about them. You can easily check if they are written about elsewhere on this site by checking on the site map, link at bottom of page.